I can’t remember what prompted me to make this. 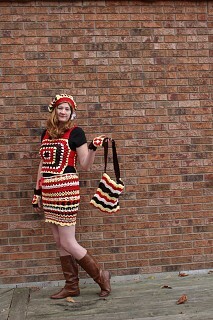 I worked off and on crocheting this outfit for about a year. Most of the yarn came from my mother’s basement. I also asked her advice about colours and patterns since she was in her late twenties for that era. This was so much fun to make. Hat – I saw a picture of a similar hat from the 70’s and loved it. It only took me a little time to figure out the pattern to make my own. The top is a pentagon and then there are 5 granny squares going around and then a band. Shrink – That’s what the tank top thing is called. I had no idea, my mother told me. Again this is from a picture I found online. It’s two large granny squares with a couple of rows of double crochets to connect them. The shoulder straps took longer to figure out. For each one I had to make two halves and then stich them together. 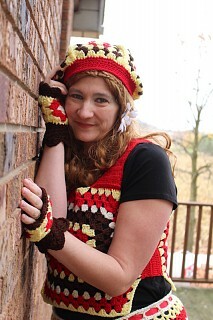 Fingerless gloves – I started with granny squares and then added the scallops on each end. Skirt – I had lots of fun with this. No pattern. I just made it up as I went along. The crochet equivalent of draping. I experimented with different types of stitches. 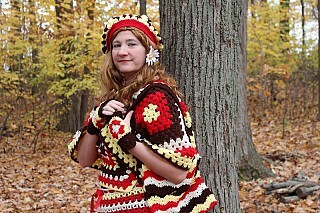 Shawl – I saw a picture of a granny square poncho from the 70’s, but I hate ponchos. I took the general look and made a shawl instead. Bag – I nice wave pattern. I made sure to line up the colours when I did the trifold to have a pouch and flap. The strap is made out of double crochet’s. Maurishio-kun Wow seriously, kudos for crocheting all that costume, it must have been a lot of job and the color pattern and the final result look so astonishing!